Last week we had the latest London IA evening, featuring a packed programme with an IA Summit theme, as Tim Caynes and Johanna Kollmann reprised their talks from New Orleans, and Giles Colborne provided an overview of the event. As ever, Sense Worldwide were our hosts, and Zebra People our sponsors. I’ve already published my notes on Giles’ redux of the IA Summit and Johanna’s talk about “messy problems”. Here are my notes from Tim’s talk. Tim Caynes was talking about the design process for “the mobile wallet”. He has a great presentation style, and some brilliant slides that often focus on close-ups of his confused face as he wrestled with why anyone would want a mash-up of their wallet, debit cards and mobile phone as a product. Unless, of course, you are a telco, bank, or retail giant, where having a loyalty card with in-built GPS that ties all of your behaviour together sounds like a great wheeze. Tim used a lot of humour in his talk - perhaps a self-defence mechanism when you know you have been through a bruising design process. Certainly the work to get a mobile wallet into the hands of consumers seems to involve an incredibly wide range of stakeholders. I thought a couple of things he said were worth applying across any design process though. The first of these was the trade-off between simplicity and complexity. He explained that there were two options with the mobile wallet - make it simple to register and then hideously complicated to make a transaction. Or make it hideously complicated to register and then simple to do a transaction. You’ll have spotted that both of those options include the phrase “hideously complicated”. Well, of course, that is inevitable for two reasons - you are dealing with someone’s money so you want it to be secure, and presumably somewhere along the way, dealing with some legacy mainframe chuntering COBOL. It is an important user experience consideration. A hefty up-front registration system risks users abandoning and not returning, but unless the “tap” transaction is effortless, there is ultimately no user benefit over the existing chip‘n’pin infrastructure. Learning to spot whether you are making the right trade-off between complexity and simplicity on any project is a useful skill. I think Tim also spoke a truth about what happens in a lot of UX processes - that the client(s) ultimately wanted a better drawn version of something that they had already invested in and were committed to doing. It doesn’t matter whether it is a mobile wallet or any other product, if there is enough senior push behind a particular product the business will go ahead anyway, regardless of user experience research. A good while ago - not at the Guardian I hasten to add - I sat through a presentation of some user testing and focus groups where the result was that about 15% of the target audience with begrudging body language said they might consider paying for product x. It was obvious that they wouldn’t. But on that basis, all the people in the room who already wanted project x to happen went on their merry way assuming they would get 15% of the market. My colleague Karen Loasby noted one thing about Tim’s presentation. He reported that most people were confused about the concept of the mobile wallet - but at no point did he explain exactly what it was. 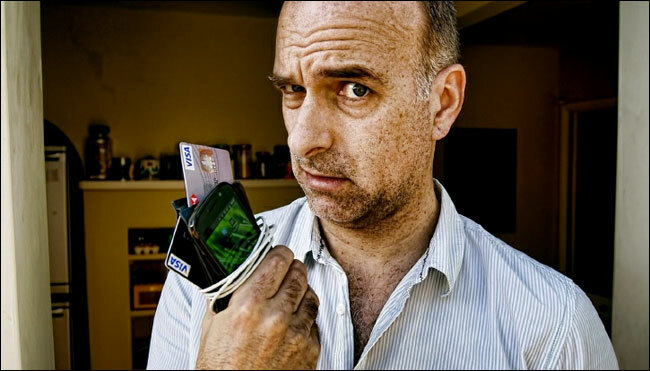 So I’m none-the-wiser as to whether what I think a mobile wallet means is actually the case. But I guess I’ll find out soon - the eagle-eyed amongst you will have spotted lots of retail stores that are gradually evolving their chip‘n’pin hardware into machines that also work with NFC technology. Having electronic money on your phone is probably inevitable. You can find Tim’s original slides from New Orleans on SlideShare. The next London IA event will be on 19 June, in a new format and at a new venue for the summer. London IA is a network of designers, information architects and thinkers. Since 2009 the group has been holding regular meetings featuring talks about UX, or of interest to UXers. This ebook is a compilation of my notes from those evenings, featuring talks by Andy Budd, Giles Colborne, Cennydd Bowles, Claire Rowland, Jason Mesut, Ben Bashford, Chris Heathcote, Dan Lockton, Relly Annett-Baker, Michael Blastland, Margaret Hanley and Richard Rutter amongst others. Topics covered range from ubicomp to psychology, from learning how to sketchnote to how to write a UX book, and how to improve digital design through diverse routes like copy-writing, designing for doubt, learning from music technology or taking care of typography. “London IA: Notes from the talks” is available for Kindle for £2.47. By Martin Belam on 24 May 2012.